Help the Locas capture zombies while traveling the globe! After containing the Great Undead Fever of 1948 across the West, Bonnie and Johnny Loca were ready to retire and take a well-earned vacation. That is, until they discovered that the zombie pandemic had spread overseas! Help them as they race across the continents to uncover the cause. Can you unmask the mastermind behind it all? 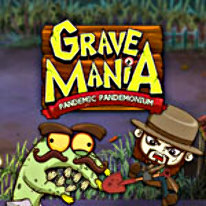 The Locas really do put the fun back in funeral in Grave Mania: Pandemic Pandemonium, a hilarious Time Management game. - Travel to exotic locations! - Memorable characters will keep you laughing! - Thrilling Match-3 Chase scenes! - Collect all the achievements!